Carlo was invited by Oana. Carlo is one of these people I know over twitter. What I find interesting about Carlo, is that he is calls himself a developer and a system administrator. A DevOps avant la lettre. On his website he mentions he uses Pomodoro Technique. Which is not so strange knowing he is Italian. Many people who know me as an IT professional ignore the tremendous impact that my wife Karina has had in my life. To make a long story short: she held my hand, in the last 8 years, while I learned how to be proud of myself – and not ashamed. (Bio Time! 😉 At 18, I was sure I would have become a journalist – possibly a Robert Fisk, or a Ryszard Kapuscinski. When I did actually study media and journalism (and learned about news-making routines, construction of reality, self-censorship) all poetry vanished. I did not want to be “part of the machine”. Still, I was fond of semiotics, and international relations. This somehow led me to a sincere involvement with grassroots activism and free software. I started to “do web” more seriously around 2000. In my current daily IT job, while designing and developing what we call “sustainable IT solutions“ I feel that I’m part of this “global effort“. Delivering real value, delighting customers, respecting co-workers, creating win-win-win situations, … – I am giving my small but concrete contribution. Whenever I manage to perceive myself *aligned* with this goal, and with all other people walking the same path, I feel just great – smiling, light, energized. And of course this is something good – for me and for those around me. On a much more trivial level, I’d like to list a couple of other challenges I’m facing. Second, I’m looking to find my balance, in an actual context, where I need to be a charismatic leader (and not just only a servant one) without letting my ego expand too much and narcissism prevail. These challenges are very good, since they’re part of my walk of continuous self-improvement. I’m very happy to see myself getting slowly better and to be able set the bar each time a little higher. – Desire of growing, of evolving. – The pleasure to learn. – The will to feel proud of myself. – The beauty of sharing. Generally speaking, I love it when others appreciate something I do (and I’m happy if they use it, practice it, enjoy it :-). I’ve recently read Jim Womack Gemba walks. An Agile enthusiast and practitioner for a few years, I’m getting more and more passionate about Lean. I’m currently reading Stephen Denning “The Leader’s Guide to Radical Management”. (Both of them on my Kindle). Please send these questions to Claudio Perrone. Already known at the international level, he is doing an amazing job, especially with lean tools applied to the IT domain. And send them also to Jacopo Romei. He’s not so famous outside Italy, but he’s a very smart, skilled and creative agile coach – and he’s very active in grooming the Italian agile community. If you like these questions. You can read Carloz and similar answers in our book Who is agile. 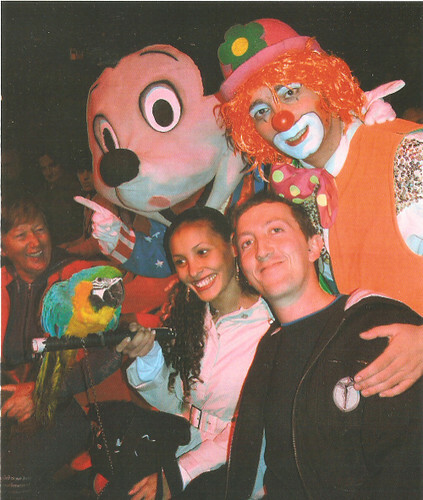 I hope that Carlo is not the clown in that photo. :-> Carlo, you are someone I would love to meet in person! For one thing, it sounds like you have a great sense of humor. For another, your passion for changing the world sounds like it would be contagious. I’m the one in the bottom right corner 🙂 On my left you can see my wife Karina, then the parrot, and then my mother.